Teach arrays and simple array commands! The projects inside this monster-themed box provide practice using arrays and simple array commands. 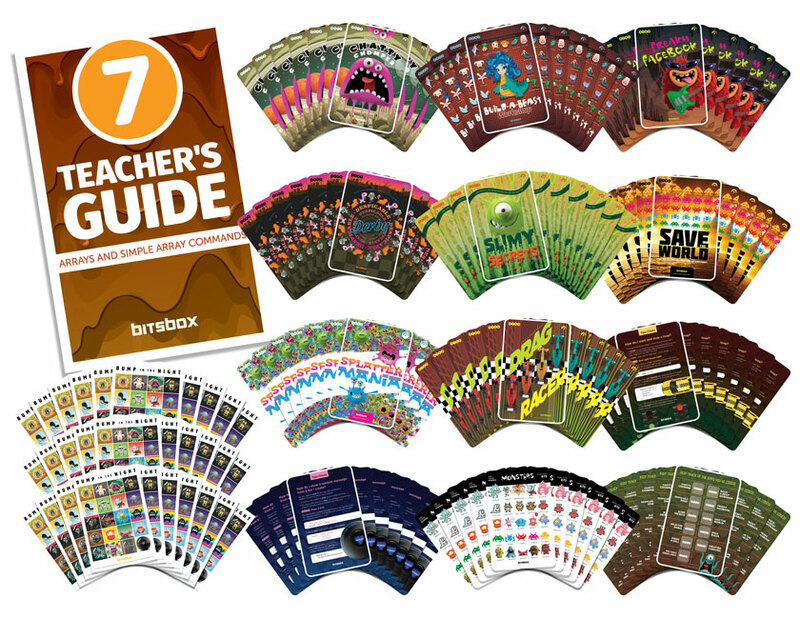 The Teacher’s Guide explains the use of arrays and the Bitsbox push and .length commands. There’s also a glossary for each coding project detailing project complexity, coding concepts included, instructions on how to use the app, suggestions to alter the app, and a URL to see the app in action. Chatty Chomper: Monsters say the craziest things! Build-A-Beast Workshop: Tap to invent hilarious hybrid creatures! Freaky Facebook: Create the craziest social network you'll ever see! Despicable Derby: Tap to start the race and cheer for your favorite. Slimy Secrets: Draw secret pictures and messages and watch Mr. Slime reveal them! Save the World: Only you can save our world from the alien menace. Splatter Mania: Never ending splats! Drag Racer: Who are you rooting for? How do I start and stop a loop? How do I show a random message from a list I create?